Loretta recommends and works with a number of local landscape installation companies. When they install a landscape plan by Loretta she visits the project during the project development and completion to ensure that the plan evolves as anticipated. Loretta also may be hired hourly to assist a client with a landscape installation that they are executing themselves. She is often hired to mark out bedlines and hardscape layout, help with boulder placement, review progress and place plants. 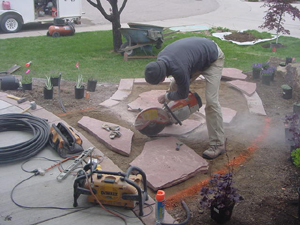 Having a landscape plan gives a homeowner many installation options. The option chosen will likely be motivated by cost and time. They may hire a reputable landscape installation company to do the entire project. They may install the plan themselves if they have the time and are willing to learn the tasks involved. Or they may do a combination of the two and perform the tasks involved that they feel prepared to do and leave the rest to the professionals. 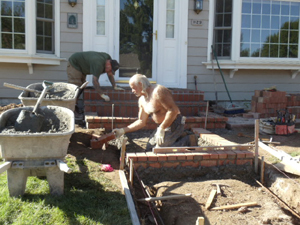 Another option is to install the plan in phases, breaking the cost into manageable pieces.